No single thing is as valuable as your wellness. But for many of us, total wellness is elusive. I'm talking the kind of vibrant, resilient and joyful existence that most days seems out of reach. I can only speak for myself here, but I haven't stopped trying. True health is a constellation of factors. It requires adequate sleep, positive relationships, truly nourishing foods, proper hydration and a resilience to stress. The trouble is that our modern environment is absolutely opposed to our fulfillment of these things. We carry around artificial suns in our pockets that scramble our natural sleep and wake cycles, we are increasingly torn away from real in person relationships by social media, which is highly addictive. Our grocery stores are packed with foods that claim to be healthy but that are actually killing us. We've been absolutely hoodwinked by the food industry and are paying dearly for the privilege. Our normal daily stresses nag day after day, month after month taking a disastrous toll on our health. 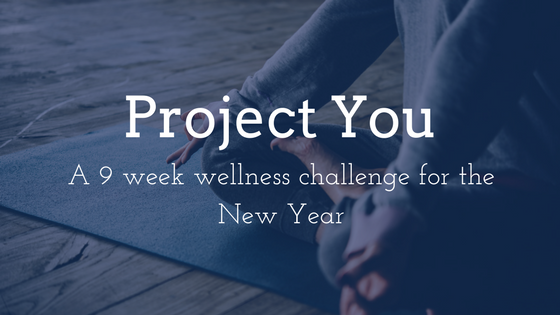 This January we ask you to join us for our New Year Wellness Challenge. Commit to something that is protecting your most valuable asset, your health. It won't be easy, but you will have support. You will have peers and coaches to encourage you. At the end of this 9 week challenge you will know yourself better, you will understand how to truly care for yourself. And you will have made some new, positive and proactive friends to encourage your progression after the program has ended. We believe that Yoga is a vital part of a healthy lifestyle. It provides healthy movement opportunities and is a good way to get in your weekly strength and resistance training as well as light cardio. Most importantly though, Yoga helps us to develop the deep personal awareness and objectivity that we need to make positive change in our lives. Our evolutionary legacy is to MOVE. Going to the gym and to Yoga is wonderful for you, but what about the other 14.5 waking hours of the day. We’ll stay active during our challenge, taking any and all opportunities to take the stairs, lift heavy stuff, rough house with the kids, make love, jump up and down or crawl under things. Whatever keeps you active! There is no path to optimal health that doesn’t address diet. We don’t mean the temporary diet you go on to lose weight. We mean to create sustainable eating habits that really, truly nourish you. We’ll be exploring the capacity of the ketogenic diet to kick the S.A.D (standard American diet) of carbs, sugars and toxic oils. As our guide we will be using the book The Keto Reset Diet: Reboot Your Metabolism in 21 Days and Burn Fat by Mark Sisson. This book will be our guide but you won’t be on your own. Mandy and Matt are veterans at the Ketogenic Diet and will help you along the way. Our program will include a 3 week reset followed by a 9 week strict Keto cleanse. It won’t be easy. Carbs and sugars are deeply imbedded into not just our American diet but our culture as well. As you will see though, reducing your consumption of these foods can help you to lose weight, stabilize energy and mood, avoid all metabolic diseases (even cancer), prolong lifespan and improve athletic performance. Keto isn’t for everybody. If you are not feelin’ the whole Keto thing but wanting to join our challenge you are still welcome to join, we just ask that you set a macro nutrient level that you are comfortable with, track your food, and stick to it! Our lives are stressful, there’s no way around it. But there are a few culprits that are exacerbating the problem. Chronic exercise patterns, hyper connectivity, having too much STUFF, maintaining toxic relationships are all preventable forms of stress. We’ll take a long hard look at created stress in our lives and vow to do better. Life is too short! We’ll commit to resting when our bodies require it and truly powering down for restorative repose. During the 9 week challenge you will commit to 3 Yoga classes at Sound Method per week. We'll give you a couple of get out of jail free passes in case you get sick or have to travel. If needed, classes can be made up in another week. You'll be asked to prepare chapters from our Challenge text, The Keto Reset Diet: Reboot Your Metabolism in 21 Days and Burn Fat Forever before our first and second meetings. Mandatory attendance at 4 Challenge Group meetings. All but one of these meetings will be a potluck so we can all share healthy Keto friendly recipes. Keep a food diary. We'll discuss tracking options at our first meeting. This is not mandatory, but if you have an activity tracker we will ask you to set a realistic activity goal and stick to it at least 5 days a week. As if a healthier lifestyle weren't incentive enough! All who complete the challenge requirements will be entered to win the grand prize! A ONE YEAR Annual Plus Membership at SMY! This challenge will last 9 weeks. Come pick up your book, meet the group and learn about how the first 3 weeks will go! You'll have a chance to ask questions too. If you would like to get your "before" measurements and photo taken we can do it at our kickoff. We'd also like to record your personal wellness goal and help you to calculate your macronutrient levels. 3 week check in and potluck! - Monday, January 22 at 7 pm: This will mark the end of your reset! At this point you will have taken 3 weeks to work on your sleeping and movement patterns. You'll have an awesome start on your low carb/high fat dietary changes as well. We'll check in to discuss the next stages, visit about successes and hiccups and to enjoy a fun casual meal together. Each participant will be asked to bring a LCHF dinner item to share. This way we can try out recipes and enjoy some great cooking! Yum! 6 week check in and brunch potluck! - Sunday, February 11 at 11 am: At this point you will be 3 weeks into the next stage of your Keto diet if you choose to take on the Keto transformation. You should be feeling pretty great by now and we'll want to share! Bring a keto friendly brunch item to share with the group. Challenge Wrap Up Party - Saturday, March 3, time TBA: Celebrate! Let's give ourselves a pat on the back, reflect on our progress and announce the winner of our grand prize! The classes required for inclusion in the grand prize drawing are NOT included in the Wellness Challenge price.